Kim Sturla is our Executive Director and co-founded Animal Place in 1989. She has been a central figure in the animal rights movement for more than 35 years and wrote two precedent-setting state laws: one protecting pre-university students unwilling to participate in animal dissections, another requiring shelters to sterilize adoptable animals. Before co-founding Animal Place, she served as director of the Peninsula Humane Society. 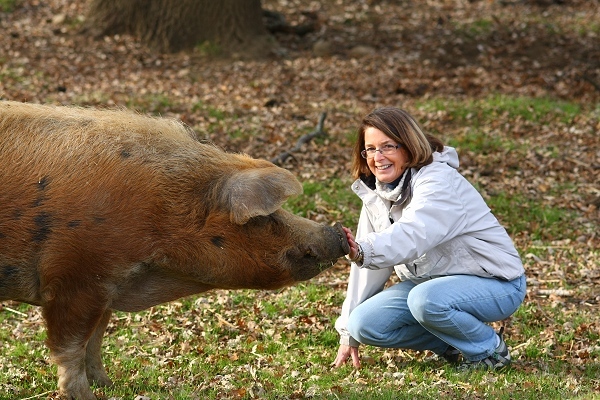 Kim is our resident Pig Whisperer, able to communicate beautifully with even the wiliest of pigs! She shares her home and life with dogs Marty and Poppyseed. Estelle Barber is our take-no-prisoners full-time donor steward who oversees the processing of donations, bookkeeping, and other vital administrative tasks. Estelle has been doing non-profit bookkeeping for over 20 years. 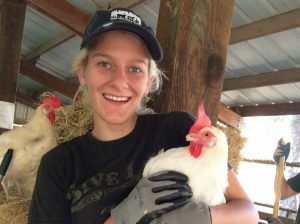 She enjoys the gratifying work at Animal Place, especially going on hen rescues. She shares five sons, one grandson, and two well-trained goldfish with her partner, Mark. 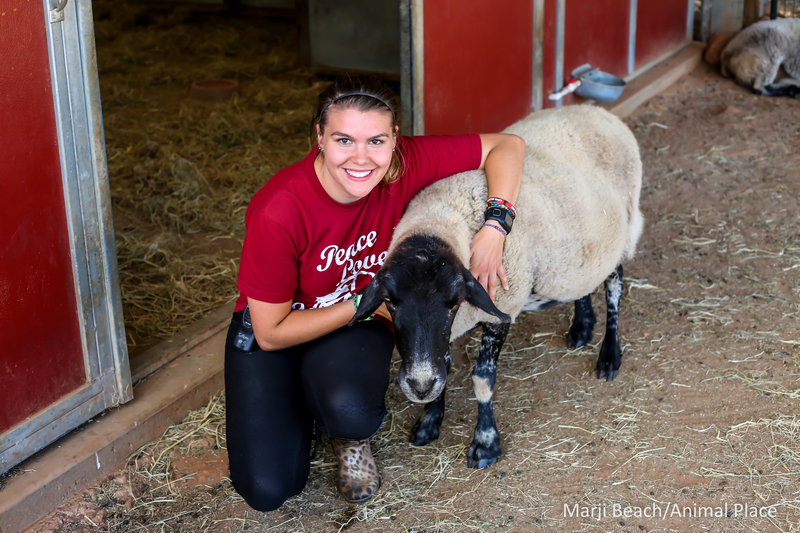 Marji Beach is our Education Director and has been with Animal Place since 2004. She earned her BS in Animal Science from the University of California, Davis. She oversees the education, social media, rescue & adoption programs of the Rescue & Adoption Center, and onsite programs at the sanctuary. She is managing editor of the quarterly magazine and website, and puts to good use her writing skills. You can see her photography of the animals here. She loves the cows and chickens! Marji is owned by Mexi-mutt mop-dog Tobi, Podenco Canario Audrey, cat Shawn, and human Izzy – all adopted! Hannah Beins is our Animal Care Director, responsible for overseeing the care of hundreds of farmed animals in residence at our Grass Valley sanctuary. 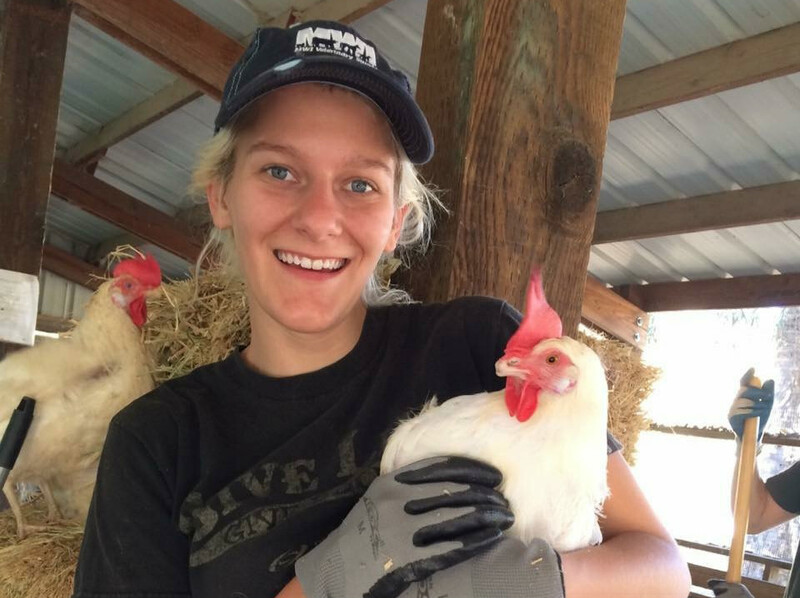 She joined our staff after completing animal care internships with both an east coast sanctuary and Animal Place. 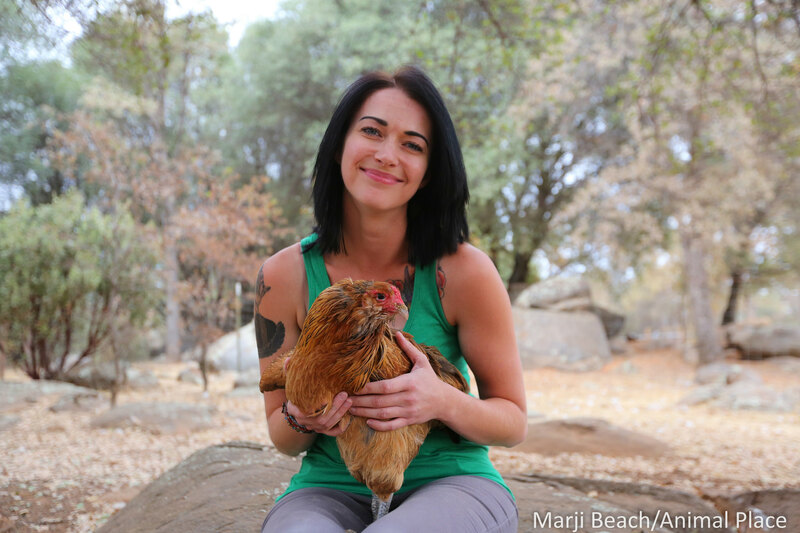 She shares her home with two dogs, Squishy and Kody, three cats, Brian, Mila, and Blue, and eleven tiny chickens. Kelcie Leach is our Adoption Manager for the Rescue & Adoption Center in Petaluma. She coordinates adoption events throughout California and interviews adopters to ensure that adoptable animals find the best possible homes. 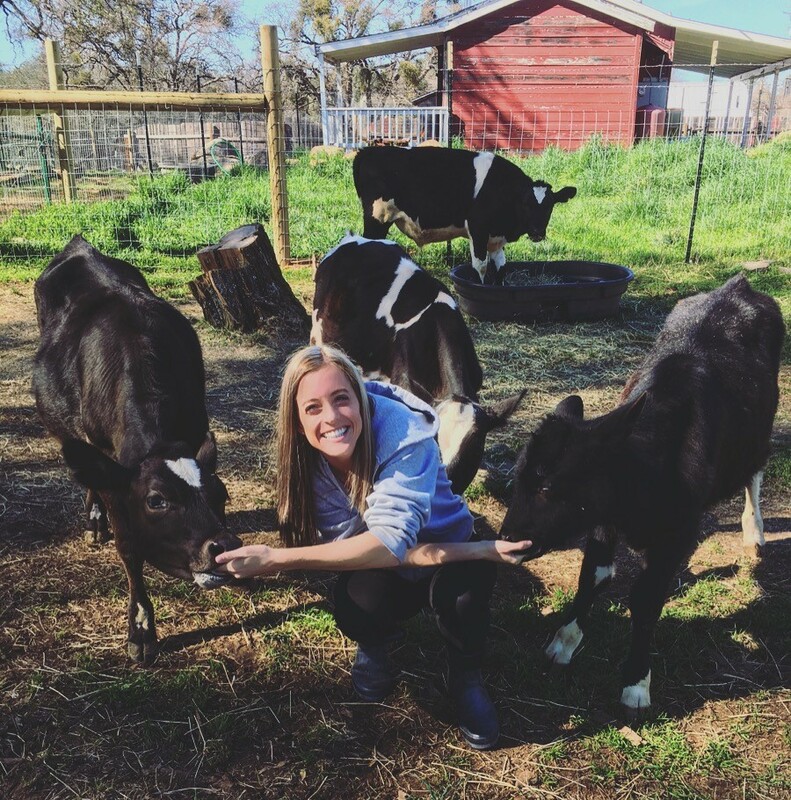 Kelcie previously worked as a Veterinary Assistant and loves to help animals in any way that she can. For fun, she likes spending time with family, eating delicious vegan food, and going on hikes with her wild child canine Milo. She is also owned by cat Pig. Patti Nyman is our Intern, Volunteer, and Campaigns Manager. She holds a Master’s degree in Social and Political Thought from York University in Toronto, and has taught undergraduate courses in the social sciences. 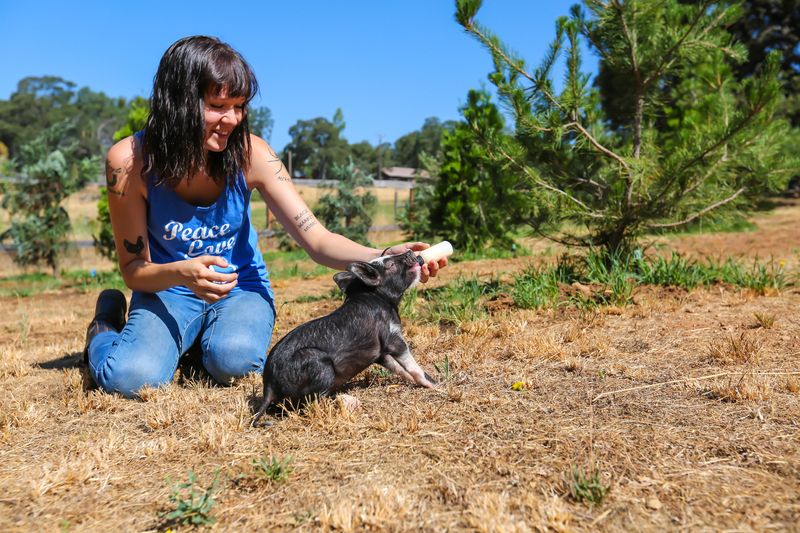 A former Animal Place intern herself, Patti oversees our internship and volunteer programs, as well as Animal Place’s Food for Thought campaign, which works with nonprofits to help them adopt animal-friendly menu policies for their events. She also enjoys playing guitar, eating carbs and spending time with rabbit companion, Binksopolis. 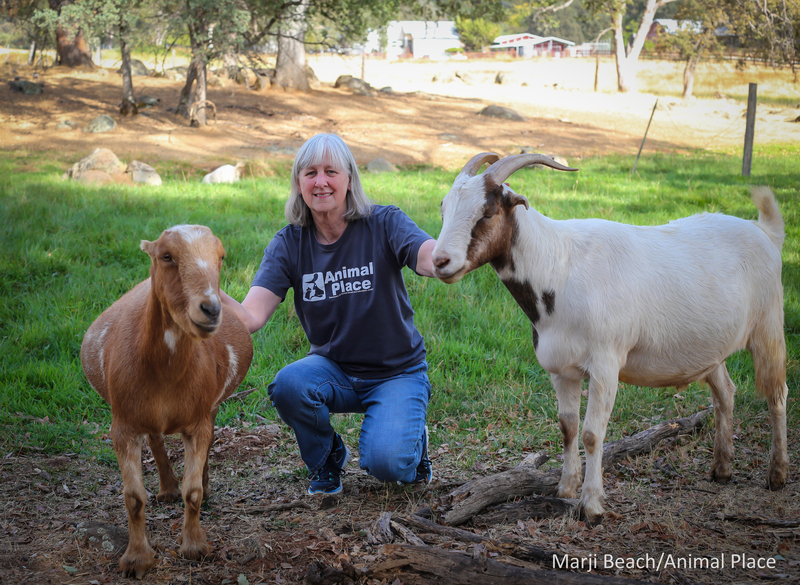 Michelle Miller is the Animal Care Supervisor and a residential caregiver at our Grass Valley sanctuary. 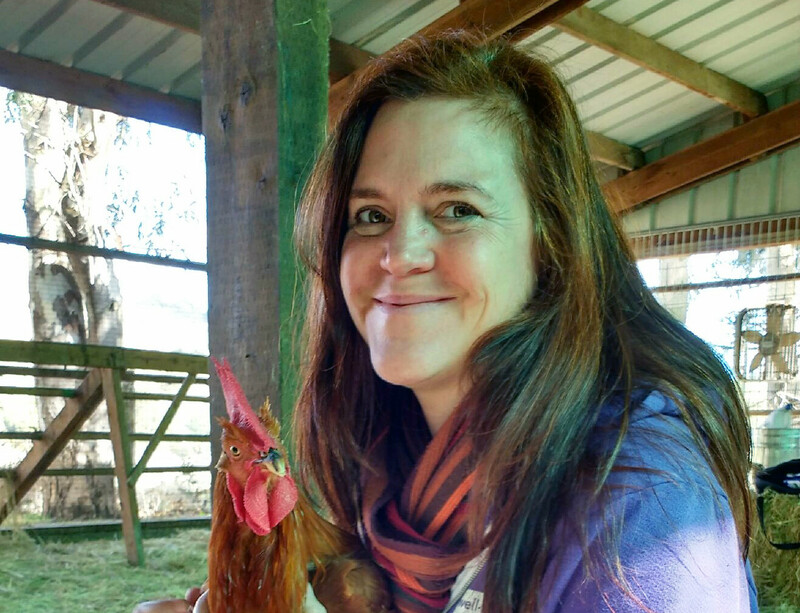 She shares her life with Levi-her husband of 13 years, their 11 year old son- Cash, 2 dogs (Howdy and Freya), 2 cats (Wednesday & Ygritte), 4 hens and 1 rooster. Prior to Animal Place, Michelle worked with companion animals in various capacities. She is passionate about advocating for pitbulls and other dog breeds targeted by negative legislation and breed specific bans. 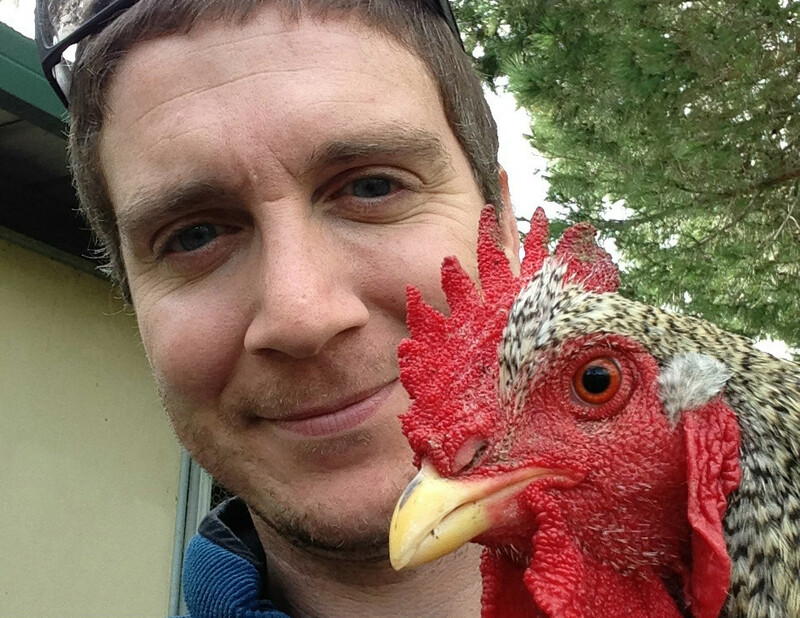 Blake Caraska is a barn cleaner at our Grass Valley sanctuary, providing care to the 300 animals at the sanctuary. He first joined Animal Place as an ambitious volunteer before accepting a staff position at our Vacaville Rescue Ranch facility. His hobbies include hiking, cycling, and cracking open a good book. Blake and his girlfriend share their lives with four cats. Brittani Peterson is our Outreach Coordinator, she coordinates our events, gives guided tours, and oversees tour schedules. She is currently studying Public Relations at Sacramento State University and will graduate Spring 2019! In her free time she enjoys Yuba river hikes, working out, game nights, and doing flips. As an official board game champion she humbly shares her home with her two cat dogs Floyd and Atlas. Claire Couron is our Social Media Coordinator. She creates content for Animal Place’s social media and engages with our online community. Claire first joined the Animal Place team as an Advocacy Intern, quickly fell in love with the mission, and became a staff member. Claire spent a year in China, and hopes to continue exploring and trying vegan food all over the world. Crystal Kozlak is our Southern California Brave the Cage Outreach Tour Coordinator. As a recent university graduate in Mathematics and Philosophy, Crystal now dedicates her life to vegan activism. With her logical background, she applies strong arguments for veganism to educate students about what life is like for 95% of the hens in the egg industry. 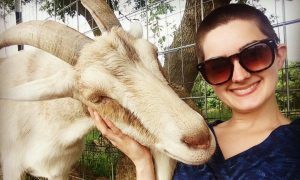 In addition to her work at Animal Place, Crystal expands her activism through her own personal blog based on the interconnection of spiritualism and veganism. She also loves cooking vegan junk food with her husband, Clark, and running half marathons! 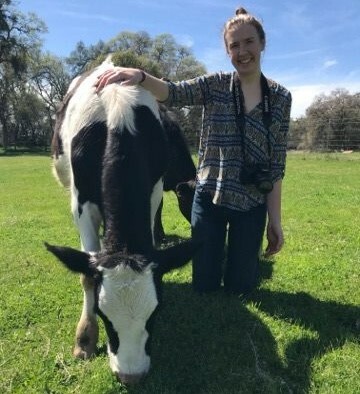 Brenda Rynders is our Volunteer Coordinator and joined the team after becoming a regular volunteer at our rescue and adoption center and main sanctuary. She holds a double Bachelor’s degree in Psychology and English and is currently pursuing a double Master’s degree in Clinical Psychology and Anthrozoology. In her spare time, Brenda enjoys spending her days with her three feisty felines and adorably obnoxious German shepherd. She also loves watching scary movies, indulging on delicious vegan cuisine, and listening to her favorite band, Ghost. 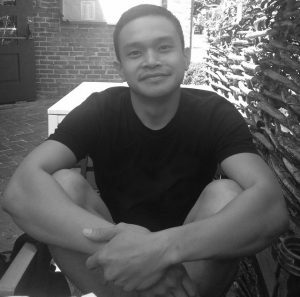 Carlo Dela Cruz is the Manager at our vegan store in Berkeley, Animal Place’s Vegan Republic. 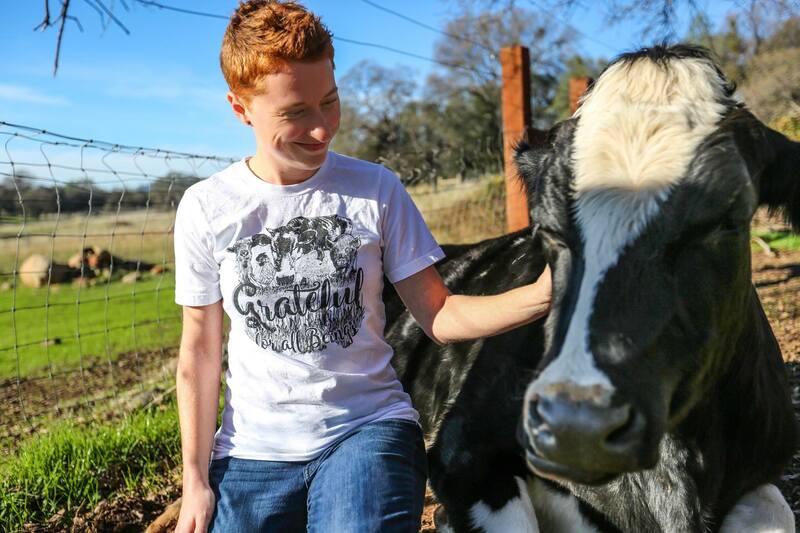 Carlo joined the team after volunteering during his spare time at the store and teaching a donation-based fundraiser yoga class at the vegan gym in Oakland, NewEthic Strength and Conditioning, from which all the proceeds went to Animal Place. He also manages the vegan day spa in North Berkeley, Spa Organica, and teaches yoga in the East Bay. When he finds time away from his busy schedule, he is outdoors climbing, hiking, and camping. Deva Holub is our Northeast Regional Coordinator for the Food for Thought Campaign. 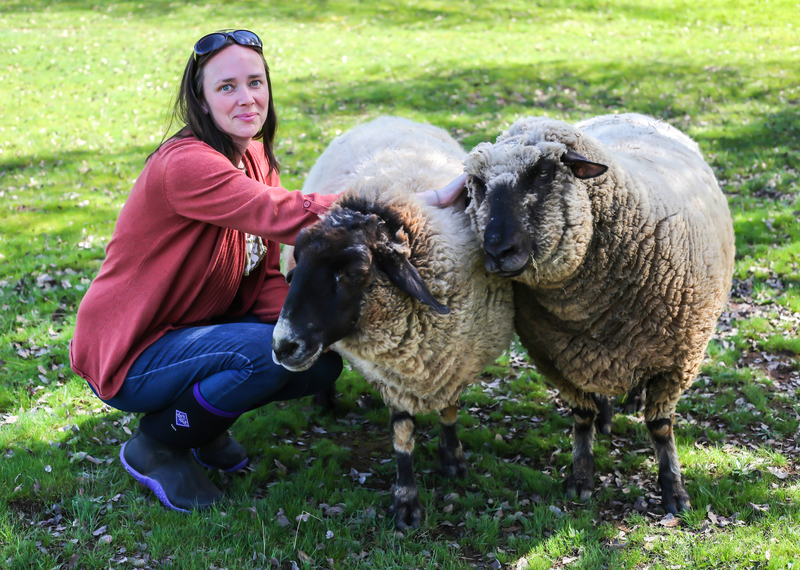 Vegetarian since the age of seven, Deva made the change to a vegan lifestyle in 2009 after reading Jonathan Safran Foer’s “Eating Animals.” She currently resides in Glen Arm, Maryland with her husband, Matthew, and two cats, Alphie and Sophie. She is also the proud co-owner, manager, and full-time baker of Sweet Dukes Vegan Bakery, a small-batch organic, vegan bakery she founded with her husband. Barbara Troyer is our Wildlife & Environmental Coordinator for the Food for Thought Campaign. 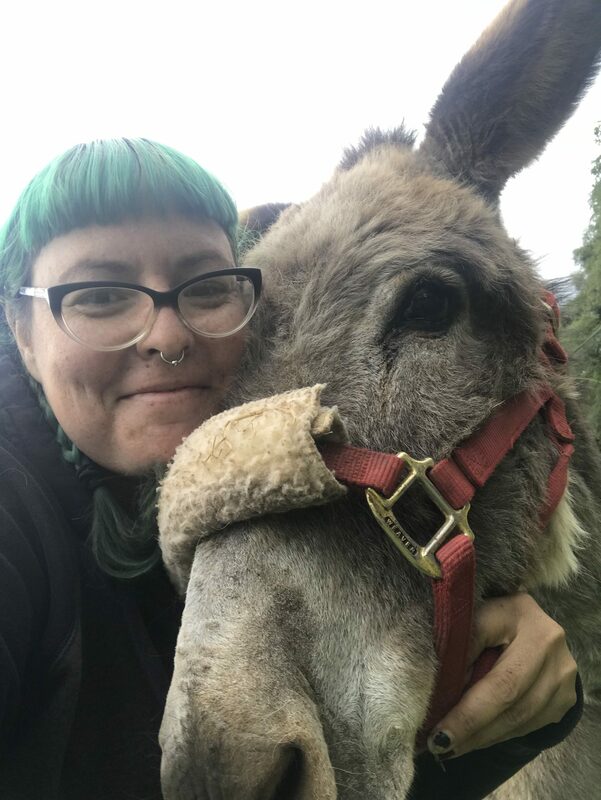 She also passionately advocates for animals, people, and the earth as the producer and co-host of All Things Vegan Radio; as Co-Executive Director of VegNet Bend; and through her work with a nonprofit that teaches nonviolent communication skills. Barb holds a M.A. 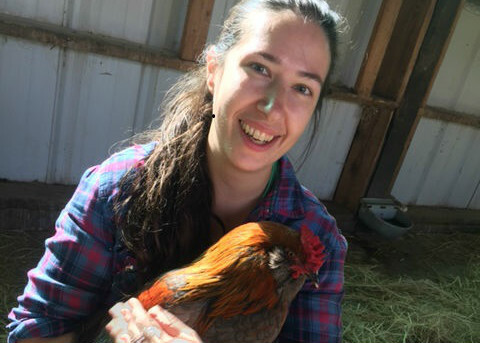 in Humane Education and is always seeking more ways to use her degree and her talent for writing, design, and IT in service to nonhuman animals. She has shared her home with many rescued cats and dogs and is currently ruled by four cats and an unruly Sheepdog/Muppet mix. Stevie Walsh is our Administrative Assistant. She studied Animal Science at CSU Chico. She loves photography, hiking, true crime, scary movies and baking vegan treats(especially sharing them with non-vegans)! Her dog, Charlie, is her absolute best friend and she takes him everywhere with her. Stevie and her boyfriend have been vegan for two years now and he is a chef and makes awesome, creative entrees!